Hope you all had an amazing Thanksgiving with your friends and family. We really enjoyed four days off around here, it was perfect. From lazy mornings, Christmas movies, birthday parties, lots of family and food. I wish it could last a little longer. But it’s just giving us a glimpse into Christmas break! I can’t wait. But first, let’s get the house all ready for it. 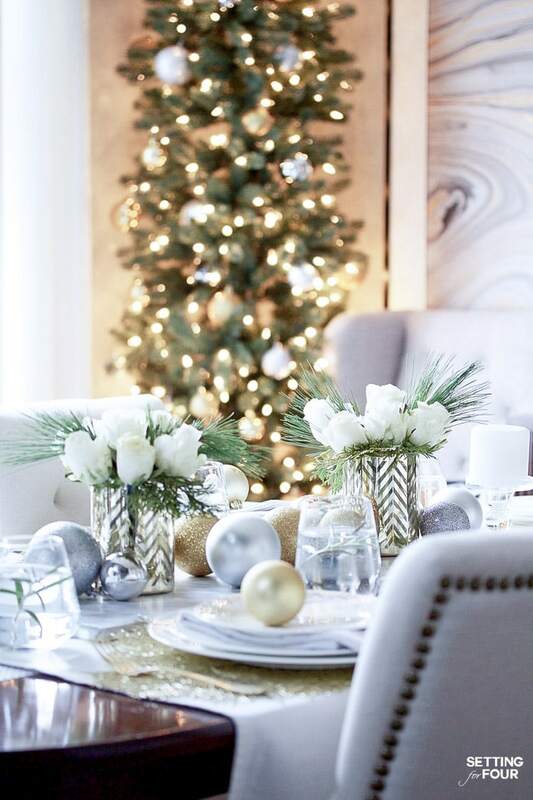 This weekend, we spent our days slowly getting our house decorated for Christmas. 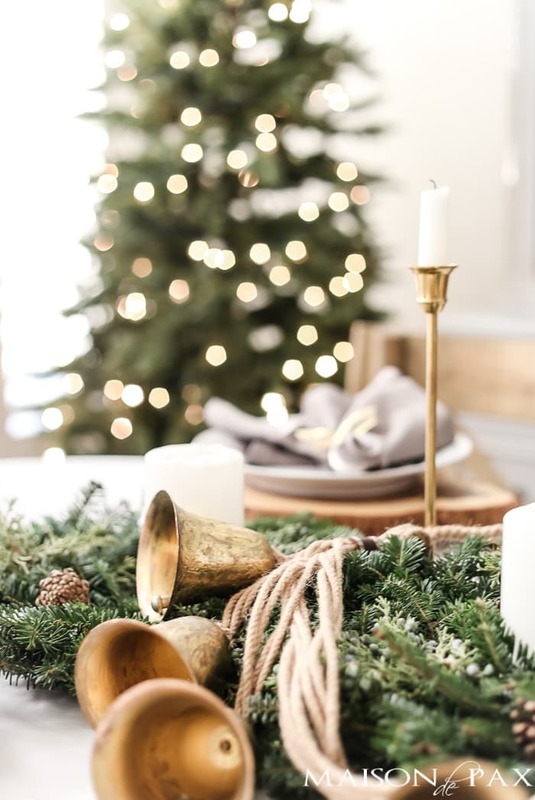 I’ll be sharing bits and pieces in the upcoming weeks, but today I’ll be giving you a peek with my Scandinavian Inspired Christmas Table. 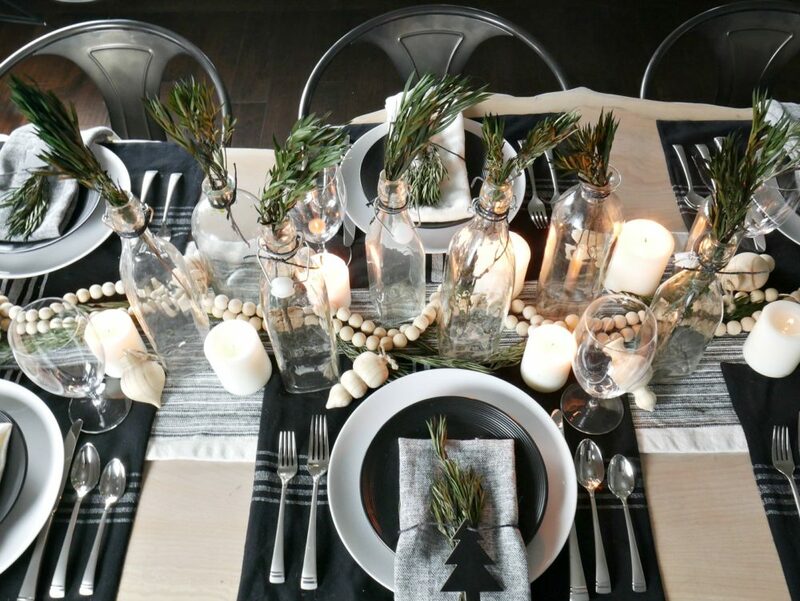 My table is just one in this Styled + Set Holiday Entertaining Tour hosted by Lory from Designthusiasm. If you are visiting from Cedar Hill Farmhouse, welcome! You can scroll down for links to all the different tables being shown this week. There is a style for everyone! Every year, I start to think about my Christmas ‘theme’ way back in August. I love Christmas and every year I want it to be a little different from the rest. 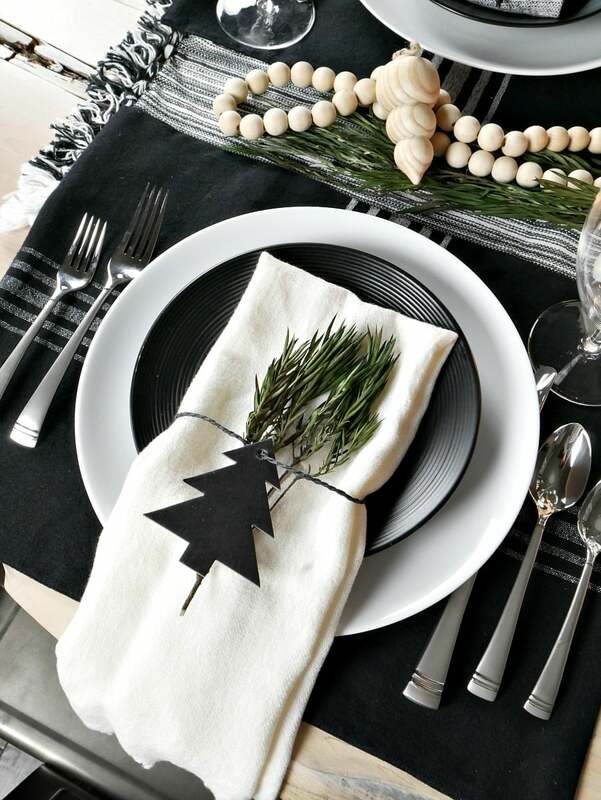 From my early stages of brain storming, I knew I wanted to go back to a black and white Christmas theme but with a Scandinavian twist. A little bit like I did a few years ago. And then, the Hearth and Hand line came out at Target and I was SO excited. Every piece fit perfectly into what I wanted for this year. 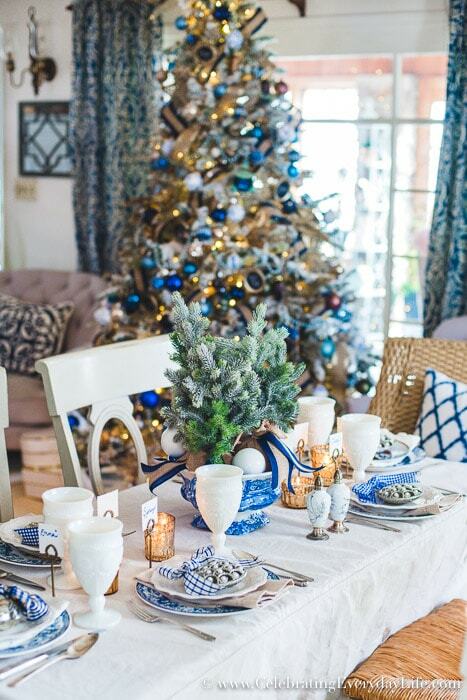 I wish I could have bought everything but you may notice a few fun pieces on my table and in my decor this year. I think Joanna totally hit a home run with this line. 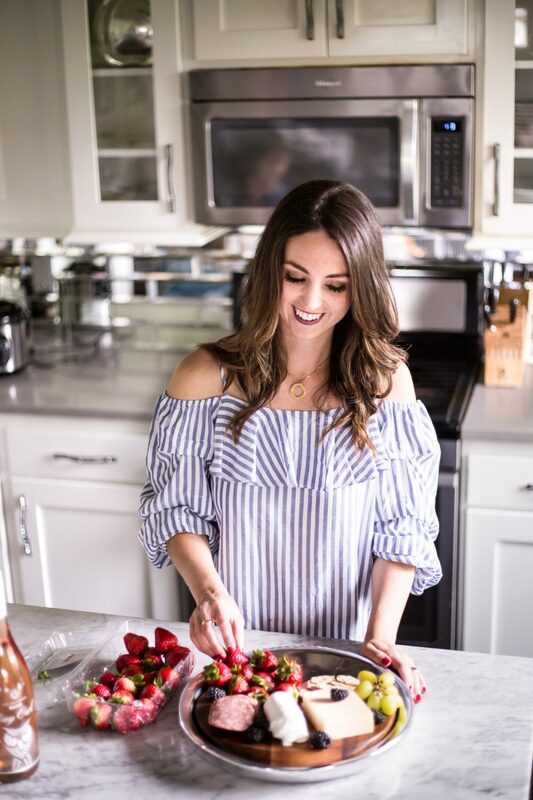 Over the past few years, I have been really working on defining my personal style. And while I know that it will continuously be changing to some degree, I really feel at home with the very clean lines of Scandinavian design, and the perfect mixture of rustic and modern. I tried to incorporate a lot of these ideas into this table. 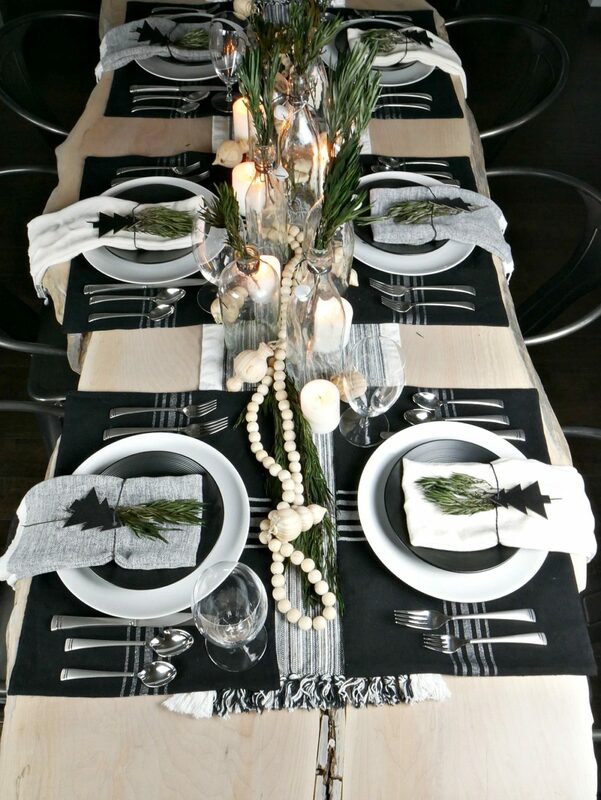 Keeping it simple, yet interesting and adding a lot of texture with the greenery and wood beads. 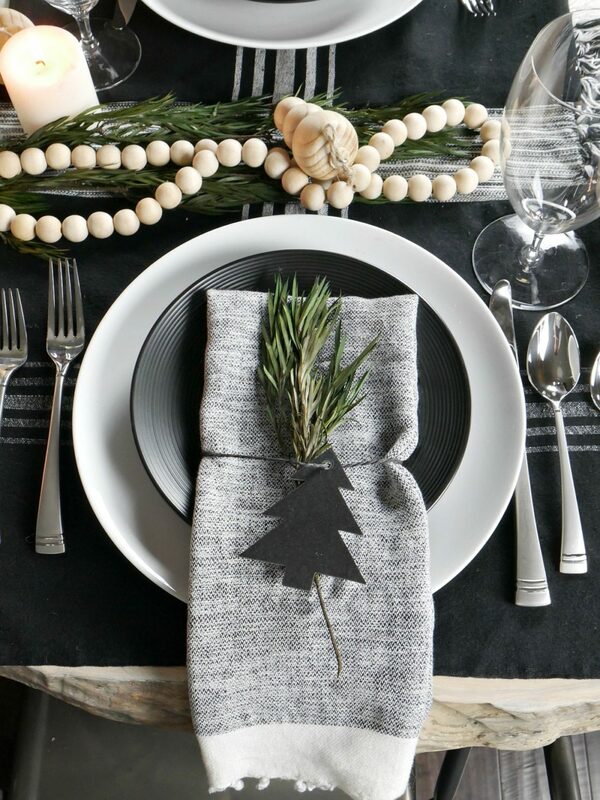 These napkins are one of my favorites. They are actually Turkish Inspired Hand Towels that I found on Amazon and they are so incredibly soft. 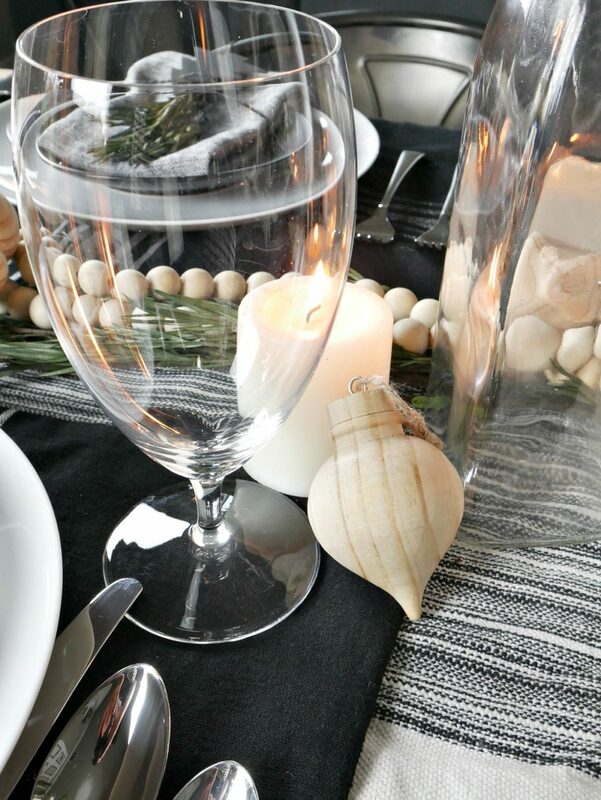 There are so many uses for them, but I just love the texture they bring to the table with the fringe. 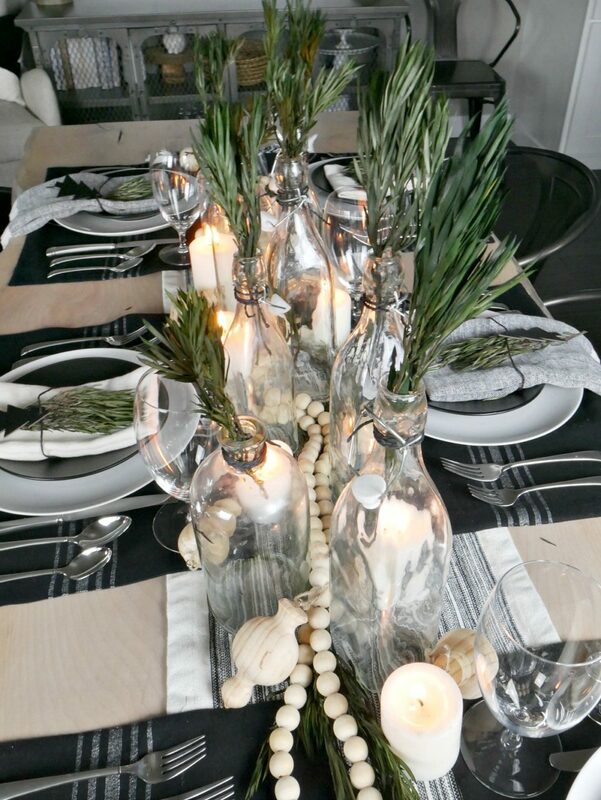 For the centerpiece, I simply took glass dispensers and vases and put a simple sprig in the tops. Surrounded by candles and wooden beads and ornaments. 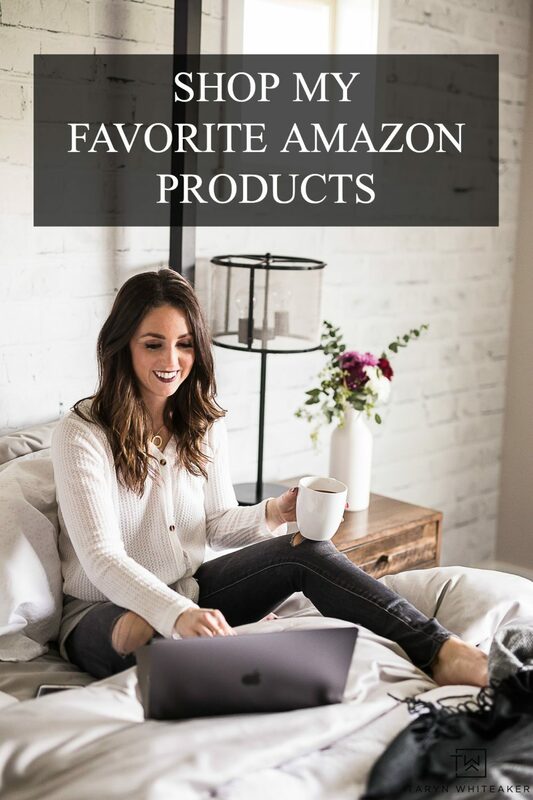 Every once in a while I come across an item that I use over and over again. And these wooden ornaments are one of them! I found them at Michaels a few years ago in the wood craft section. Except, I knew right away I didn’t want to paint them. I loved the raw natural wood. I have used these ornaments for SO many things and I’m not tired of them yet! Want more inspiration?! 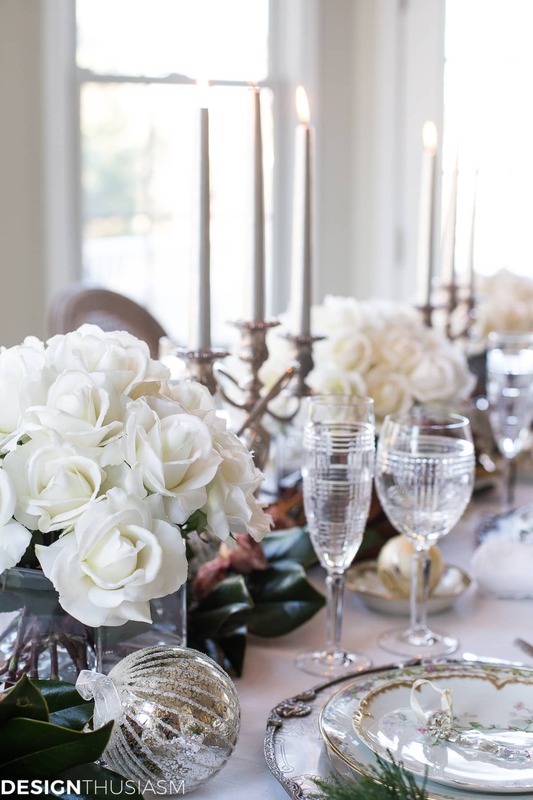 Head to Celebrating Every Day Life and scroll through all the gorgeous tables on display this week! 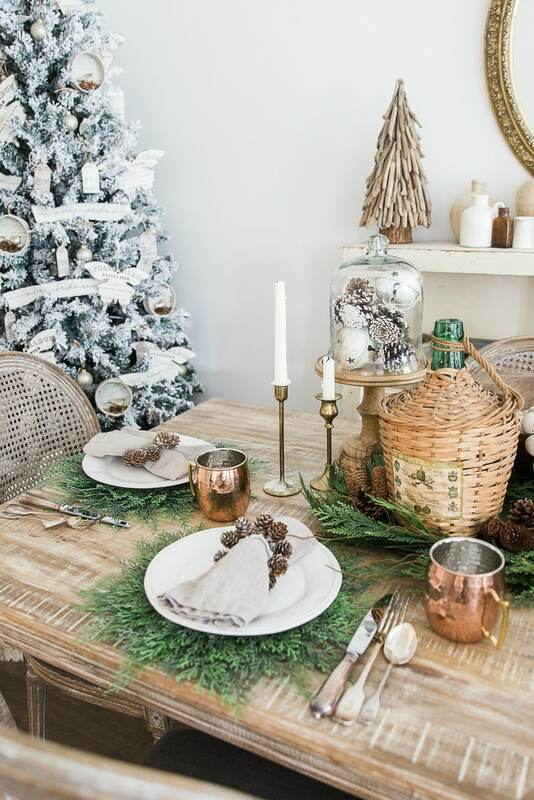 I love the raw wood and greenery in your tablescape, Taryn. And I saw you on Rachael Ray last week! You did such an amazing job!! Congratulations! What a fabulous theme, Taryn!! 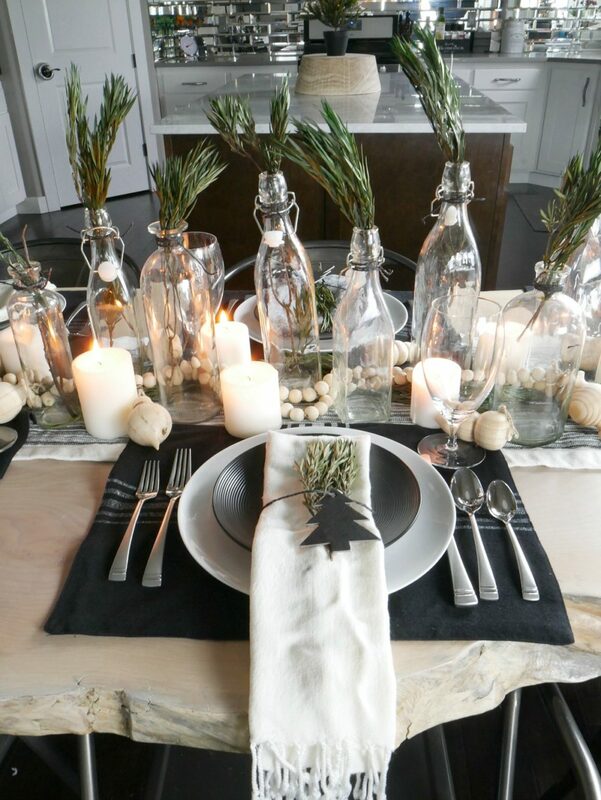 Love the bottles along the center of the table and the greenery throughout! So pretty and unique! 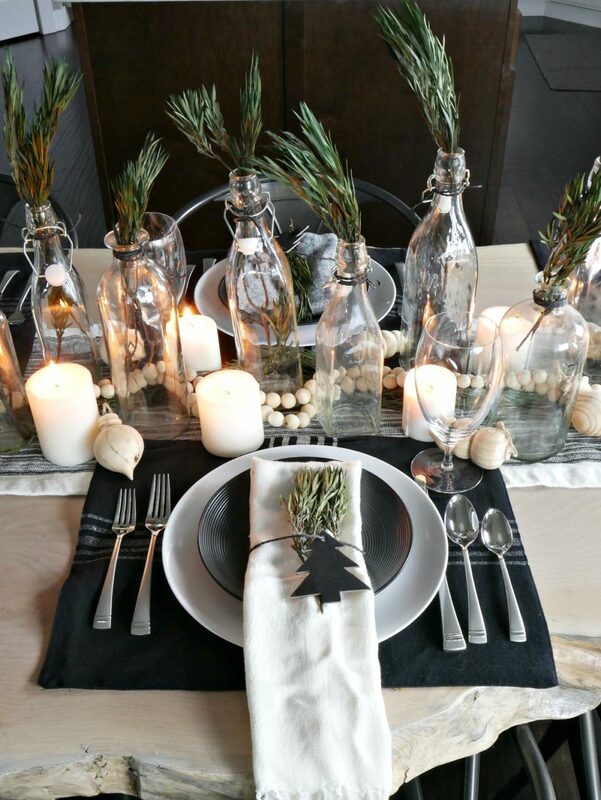 What type of greenery did you use in this table setting?